Provide comfort for the family of Aurelia Di Rocco with a meaningful gesture of sympathy. With great sadness we announce the passing of our dear angel Aurelia Di Rocco. At the age of 77 years, God called on Aurelia on Saturday, April 6, 2019 and she passed away peacefully with her family by her side. Beloved wife of Luigi Di Rocco. Loving mother of Tony (Giovanna) and Rosanna. Devoted Nonna of Melissa, Tomas and Lucas. Cherished sister of Lina Di Febo. Aurelia will be sadly missed and fondly remembered by all her extended family and friends. 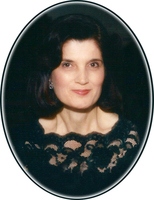 To plant a memorial tree in honor of Aurelia Di Rocco (Gentile), please visit our Heartfelt Sympathies Store. We encourage you to share your most beloved memories of Aurelia here, so that the family and other loved ones can always see it. You can upload cherished photographs, or share your favorite stories, and can even comment on those shared by others. In Deepest Sympathy to the family with Fond memories.